1- Are remote visits safe and effective? Video visits aren’t the right solution for every type of case, of course, but when used appropriately, studies show that they produce health outcomes on par with in person visits. Telemedicine has been shown to be effective for the treatment of everything from depression to postoperative follow-up care. 2 – Do patients like them? Patient satisfaction studies indicate that patients are as satisfied or more satisfied with the care they receive via video compared to in-office visits. Not every patient will opt for a remote encounter, but many are eager to eliminate their travel time and cost. 3- Do I have to see a patient in person before doing a video visit? This depends on the regulations in your state. Some states do require that an in-person relationship is established before a video visit, but many have decided to eliminate this barrier to the expansion of telehealth. 4- Can I prescribe medicine? 5- Will I get paid for video visits? In most cases, the answer is yes. Currently, 33 states have laws in place that require payment for video visits on par with in-office encounters. An additional seven states have similar legislation pending. 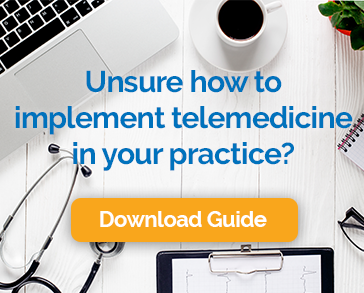 In addition to state requirements, many insurance carriers have recognized the value of telemedicine and will reimburse for such services even in states where they are not required to do so. The situation is a little different with Medicare and Medicaid (here’s more detail), but there are signs that both programs are considering expanding the scope of telemedicine. 6- Is the technology secure? Protecting patient privacy should always be a top concern when introducing new technology. Purpose built telemedicine platforms, like Chiron Health, include several layers of security and architectural practices to ensure that patient personal information is protected. Our solution is HIPAA compliant and we will enter into a business partner agreement. Consumer grade applications like Skype and Facetime should never be used for video visits because they don’t meet the minimum security threshold. 7- Are providers, staff, and patients able to use the software easily? Not all telemedicine software is the same, so it is important to check out the usability on every system you consider. The one you choose should be as easy for patients to use as the other applications they use to communicate with friends and family. It should have built-in support and work on all of the devices that they love. 8- Will it integrate with my existing patient management systems? Yes. You can find a telehealth solution that will integrate with your EHR, passing information back and forth when a video visit is scheduled and completed. 9- What types of encounters work best over video? Telemedicine is used in one way or another in almost every specialty. It has a growing role in the treatment of cancer, in mental health, and in dermatology. It is an excellent substitute for an in person encounter for follow-up visits, medication management, lifestyle coaching, and the care of chronic conditions. 10- What are the benefits for providers? There’s a lot to love and very little to fear about adding video visits as an option in your practice. Patients enjoy the fact that they don’t have to take time away from work or family. They love cutting out all of the travel and waiting time, and they are more likely to comply with follow-up instructions. We help new providers get their telemedicine program up and running every day, so if you’ve got more questions, please don’t hesitate to ask.